Anatomical diagram of a horse, lateral view, with the skin removed to show the muscles, fascias, ligaments, nerves, arteries, veins, glands, and cartilages. 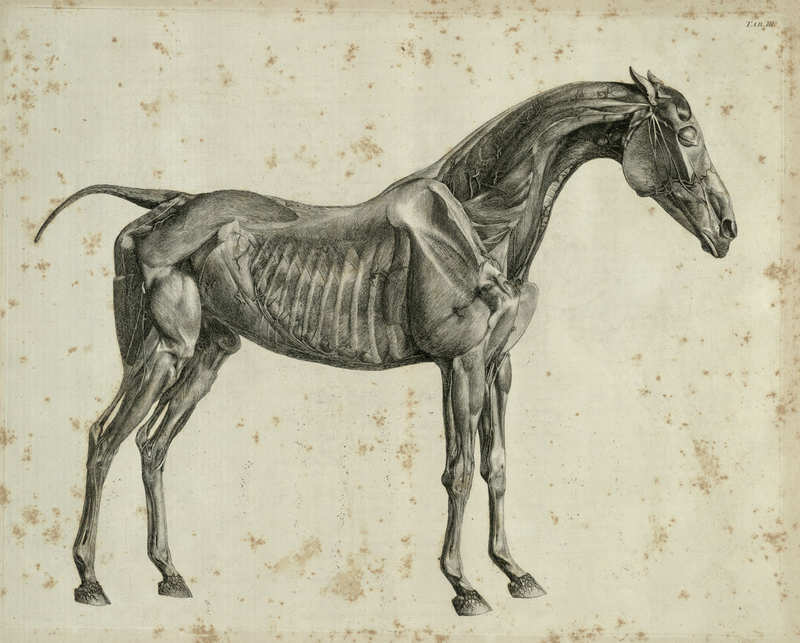 The Anatomy of the Horse by English painter, George Stubbs, was first published in 1766. In this landmark work, Stubbs acted as both anatomist and artist, performing the dissections and making engravings from his own drawings. Stubbs, George, 1724-1806, “The third anatomical table of the muscles, fascias, ligaments, nerves, arteries, veins, glands, and cartilages of a horse,” The College of Physicians of Philadelphia Digital Library, accessed April 24, 2019, https://www.cppdigitallibrary.org/items/show/2488.